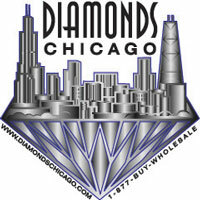 Diamonds Chicago is a Wholesale Manufacturing Jeweler. This Means that we manufacture our own Finished Fine Diamond Jewelry for the purpose of supplying Jewelers, retailers and other dealers. Since we have our Bench jewelers on site. We can do Jewelry Repairs Usually while you wait. Most Jewelers have to send the work out to manufacturers like us or some bench jeweler that they sub contract. We can Size your ring, tighten loose diamonds, add diamonds to your exhisting settings or just polish your jewelry and make it look like brand new again. Diamonds Chicago Jewelry Repair Bench Jewelers can Do any Jewelry repair job you need in a timely and professional fashion. Diamonds Chicago also specializes in custom jewelry designing and manufacturing. We can use the diamonds from your old setting and make you a brand new contemporary design (or antique design) setting. Diamonds Chicago's Bench Jewelers can also professionally hand engrave your setting. We can engrave a sentence, phrase or date in the inside of the band, we can hand engrave antique or "vintage" designs on the outside of your ring or one of ours that you have selected. We also have many antique and vintage designs already hand engraved for you to choose from. Don't forget, we can always custom make your perfect ring to your exact specifications, just for you. Since we mostly deal with Retail Jewelers, We simply request that you let us know that you are coming in for the jewelry repair or custom design by calling us ahead of time. Most Jewelry repair in chicago can be Repaired same day! Some Jewelry Repair in Chicago takes a bit more time.